I am definitely flying the flag for Fashionable Stamping Challenges today and "London Calling" is my theme. I am so lucky that I can get a train locally and be in the heart of London in 40 minutes, whether that's for a show and meal, an exhibition or gallery; or just mooching around the shops and places like Covent Garden. This is my piece depicting my capital city where you can find so many famous places, wonderful buildings, architecture and beautiful walks. Some of these things are shown here. I started with paper from the docrafts papermania range called bookprint. This was inked and spritzed to give it colour and an aged feel. 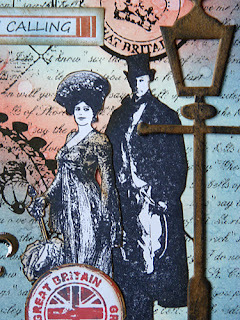 I have stamped using Indigo Blu Pomp and Pageantry set, made the title and added some bunting and other little bits. 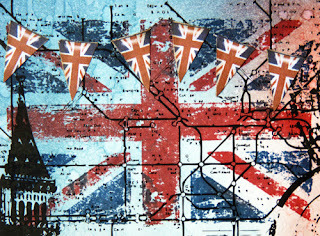 Show us your capital city at FSC this fortnight and you could be in the running for a prize or place on the catwalk. My lovely teamies have made some fabulous creations and of course from around the world. wow very nice, the longer you look the more you see! This is an absolute stunner Brenda! Just love all the fabulous stamping and subtle touches of colour. So very shabby chic too. Fabulous London images, blending together beautifully - absolutely love it! A fabulous card Brenda. Love the collection of layered images with your background. Stunning. Haope you're having a good weekend. Brilliant Brenda love how everything really gels together. The composition of this is amazing Brenda - I love that set of stamps and how you have arranged the images. Perfect! Gorgeous collage, love the stamps you used. You are so lucky living close to London. Hi Brenda...wow, only 40mins to London! It is 4 hrs for me to get to Melbourne! You can see how much you love your city and the fun that you must have there really shines through in this piece. A really gorgeous card Brenda. Wow, Brenda, a wonderful card with a fascinating background. Love all the elements and details. Wish you a nice sunday. Little wonder you selected London, a city you obviously must know like the back of your hand, I had no realisation you lived so close. Great layers of stamps that all work in perfect harmony. what a stunning example! the stamps are perfect for this theme! Gorgeous, love how you put all the elements together on this one, looks fabulous! Oh, Brenda, this is so gorgeous! Love all the layers and how the lamp post stands out. Beautiful! Oh this is brilliant Brenda. Gorgeous, I especially like the collaging you did! This is just fabulous! I love everything about it- awesome stamps! We stayed in ? Oschott? a few years ago and took a train into London for all of the mentioned ~ 40 minute ride- it was awesome- we had a blast! My kids favorite was a dog bed at Herrod's that was 10.000 pounds.....! Yes, it was a great day at the craft fair. Now the weather has shifted -- we are to get rain through Thursday. Luckily Saturday was a beautiful day! Your capital card looks great. I should make a capital card for the state of New Mexico. 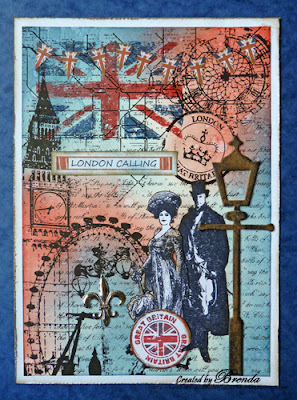 Dear Brenda, your London card is fantastic! What a great inspiration piece! Fabulous collage of stamps and colors! This is stunning and such a lovely city tribute! The lamp post is a great 3-D addition as well as the banner, which I just noticed! You rock, GF!